the FREE Slik Pro II Tripod (with Ball Head & Case, gunmetal finish), all together going for $599 with free shipping at Adorama in your choice of Nikon system or Canon system. The Thursday Adorama Snapshop Deal is the new condition Vanguard 264AB-100 4-Section Aluminum Alloy Alta Pro 264-AT Tripod Legs with SBH-100 QR Ballhead (Maximum Height 64″, Supports 15.4 lbs) going for $120 with free shipping and handling. No coupon, no rebate, just add to cart and proceed to checkout. On the utilitarian front of the B&H BF 2018 offers they are offering the new condition Oben LH-2510 Leveling Base Head for $70 with free shipping and handling. Massdrop is running a Thanksgiving Day sale and among the items offered is the 3 Legged Thing Punks tripods with three models featured: the Billy for $200, the Black Corey for $150 and the Black Travis for $140. They come with a 5-year warranty. The offers will ship in mid December from Massdrop. Punks have come a long way since the 70s, they even have tripods now 😉 Anarchy in the exposure triangle! Just like the universe expands, so do the number of products offered under Amazon’s own house-brands, including one of their first house brands, “AmazonBasics”. 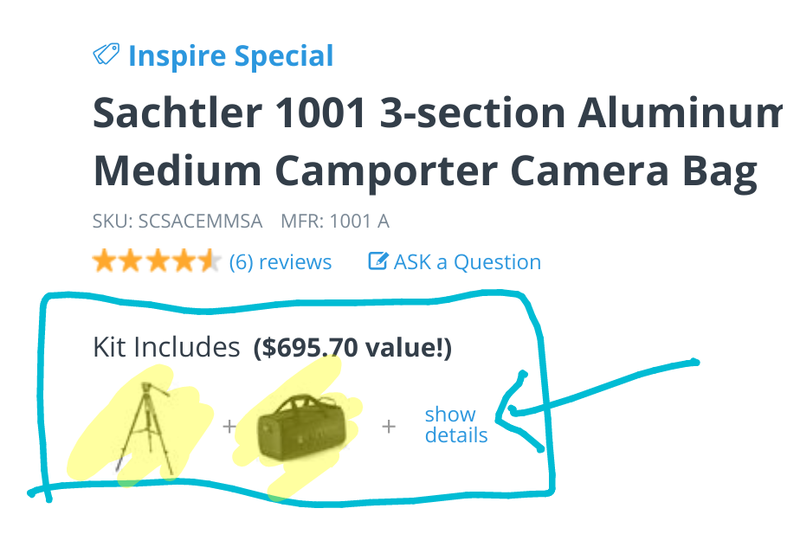 And as part of the Prime Day festivities, they have a sale on AmazonBasics products, including the new condition AmazonBasics 50-Inch Lightweight Tripod with Bag for $11 with free shipping for Prime members. Limit up to five per customer at the sale price. + that’s under $11 per season! + latest refurbished Nikon items are currently available. A price drop! The new condition AmazonBasics 63-Inch Lightweight Aluminum Travel Tripod/Monopod with Bag are now down to the very specific price of $45.47 with free shipping sold and shipped by Amazon itself. Up to three of these per customer at the sale price. They average 4 out of 5 based on 16 customer reviews. If you need a DSLR backpack and a tripod at the same time, Adorama has a bundle for you: for $180 with free shipping you can get the new condition Vanguard 264AB-100 4-section Aluminum Tripod with the SBH-100 QR Ball Head AND the Incase DSLR Pro Backpack (anthracite option). No coupon, no rebate, just add the bundle to your shopping cart and proceed to checkout. You can read details on the individual products by expanding the area under “Kit Includes” and clicking on the individual products. But to get the discount you must needs buy them as the bundle product. They go for $170 and $140 respectively on their own. This lightning deal expired… Good until 2:15pm ET the new condition Dolica TX570DS Ultra Compact Tripod with Professional Ball Head and Built-In Monopod is a lightning deal for $48 with free shipping. The price before the sale was $60 when I posted the Tuesday Lightning Deals schedule. The new condition AmazonBasics 63-Inch Lightweight Aluminum Travel Tripod/Monopod with Bag is currently on sale for $77 with free shipping at Amazon by Amazon itself with up to three per customer at the sale price. They average 4.1 out of 5 based on 15 customer reviews. If you were always puzzled why aren’t tripods and monopods colorful and vivid, well, here comes MeFoto! Adorama is having a big MeFoto Tripods and Monopods sale with prices dropping as much as 40% off. Over 50 tripods and and seven monopods are participating, too many to list here individually. Speaking of which, the Aukey Half Off coupon dropping their tripod/monopod 2-in-1 to $37~ continues to be in-stock while the phone-lens 2-in-1 for $3.50 continues to be out of stock and unorderable. Massdrop is a membership-style shopping website because some of their offers are below MAP. So you have to create a free account to participate in most activities, including buying. This is also a “group buy” style shopping website, so everything ships after the promotion ends. Shipping is typically slow and there’s no option for expedited shipping. If you find Prime 2-day shipping takes too long, then this mayhaps it is not for you 🙂 It’s a different model, so read up on it if you are not familiar with this approach. Over there, running for the next two days and a few hours (as of writing time), you can get the new condition Giottos YTL8384 Carbon Fiber Tripod for $200 with free USA shipping and handling. These will ship at the end of February. All sales are final! The orders will be shipped by the vendor and come with a 2-year limited warranty. Vanguard is having a big Winter sale at Adorama featuring dozens of products on sale. First up in the sale page over there, they have 26 camera bags, followed by 15 tripods, and four monopods, along with some spotting scopes and binoculars. The sale concludes with even more tripods on sale. Some of the tripods and binoculars have mail-in rebate promotions on them which are clearly marked over there. 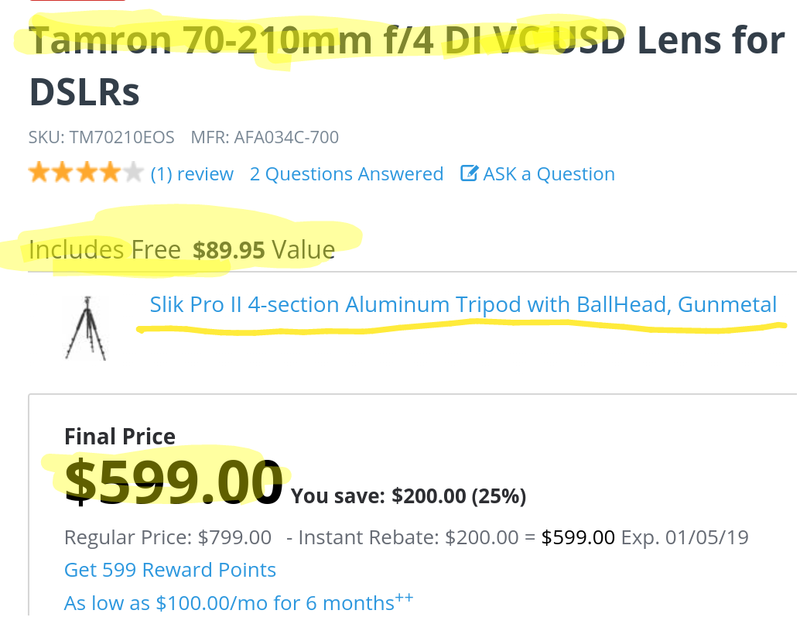 At the very bottom of the page there is a mail-in rebate promotion that gets you free spiked feet with the purchase of select Vanguard tripods. Adorama is having a Manfrotto Tripod Sale featuring 19 different options, with prices starting at $21 and going all the way up to $290. No coupons, no rebates, just add to cart and proceed to checkout. Speaking of stabilizery things, the new condition Zhiyun Smooth Q 3-Axis Handheld Gimbal Stabilizer is on sale for $99 with free expedited shipping. In other Adorama action, they have a limited time sale on select Surface PRO and Laptop models, each one going for $1099 with free shipping. This may not last long, so YMMV. 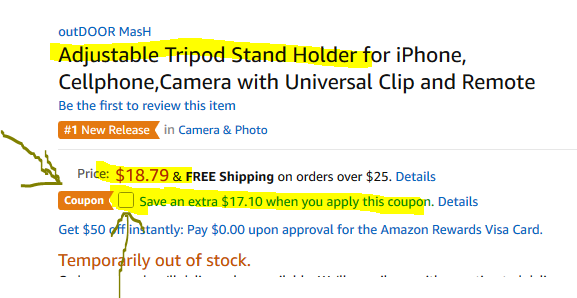 A $17.10 off green clip-on coupon drops the price of this new condition Outdoor Mash Mini Tripod (with adjustments) from $18.79 to $1.69. Free shipping for Prime members or with a $25+ order. Not sure if the coupon amount counts towards the $25+ minimum or not. The shopping cart will be more than happy to tell you. This is not an ADD-ON item as of the time of writing. Certainly can’t go wrong for under $2. This is sold and shipped by Amazon itself. Amazon itself must be the seller for the clip-on coupon to work. Sales tax may be collected on the full amount, not the after-coupon price! NOTE #2: I just purchased one to test the deal. As of 5:30pm ET, this went through without any problems! You may be able to buy more than one at the sale price. After I purchased one, the product page now shows the option to clip the $17 off green clip-on coupon once again. NOTE #3: if you are a Prime member and select slow shipping, you may be offered a $1 digital credit. It won’t necessarily ship slowly though. If you have other Amazon orders in progress, or place ones in the next few days, this may be automatically attached to them, but you’ll still get the $1 promotional credit. Adorama has just launched a Camera Accessories Sale that includes a handful of lenses from 3rd-parties (Venus, SLR Magic, Voigtlander, Irix) along with a variety of tripods, lens filters, camera bags, and more! I will “digest” this sale later on today, but I’m posting the alert now if you want to do a DIY treasure hunt. The three rows of lens filters expand horizontally, keep clicking the right arrow on the right side of the screen to see more of them. The new condition 60-Inch AmazonBasics Lightweight Tripod with Bag is on sale for the very specific price of $18.80 at Amazon by Amazon itself with up to three per customer at the sale price. HOWEVER, if you need two (or multiples of two), you are better off buying the two-pack on the same listing for $$29.75. Free shipping for Prime members or with $25+ orders for non-members. These average 4.5 out of 5 based on 6000+ customer reviews and they have over 1000 answered questions as well. Speaking of AmazonBasics tripods, their AmazonBasics 63-Inch Lightweight Aluminum Travel Tripod/Monopod with Bag is on sale for the very specific price of $87.36 with free shipping with up to five per customer. It averages 4 out of 5 based on 14 customer reviews. Colorful tripod action now. The new condition PrimaPhoto Big Travel Kit Tripod is on sale for $50 with free shipping at Adorama in the red (aforelinked) and silver color schemes. The other two colors are not on sale. Meanwhile the Manfrotto Element Traveller 5-Section Small Carbon Fiber Tripod with Ball Head (56″, 9 lbs capacity) is available for pre-ordering for $200 with free expedited shipping also at Adorama. On the high end of Manfrotto, Adorama is offering the new condition Manfrotto 509HD Video Head with 545B Tripod Legs, Mid-Spreader and Padded Bag for $1180 with free expedited shipping and handling for a limited time. Speaking of Adorama, they are also offering the new condition <>Bose Solo 15 Series II TV Sound System for $299 with free shipping and $15~ promotional rewards. The new condition Benro C1573FS2 Video Head and CF Flip Lock Legs is currently on sale for $199 with free shipping at Adorama or if you have Amazon Gift cards, you can also get it by Adorama thru Amazon. If you need two tripods, or need to buy more tripods in multiples of two, Amazon is offering a 2-Pack of 60-inch AmazonBasics Tripods with Bag for $26 total with free shipping for all. That’s $13 per tripod. One goes for $23.48, so it’s almost a two for one. They average 4.5 out of 5 based on 5880+ customer reviews and they have over 1000 questions answered, so they are thoroughly vetted by the interwebs. This model should not be confused with the 50-inch model with bag which goes for $13, also on sale. Speaking of AmazonBasics, their 67-inch Monopod goes for the very specific price of $12.67 with free shipping for Prime members or with a $25+ order as usual. Limit five of each of the ones mentioned above per shopping cart.